When I found out that I was invited to Los Angeles by Walt Disney Studios for the THOR: RAGNAROK event, I literally screamed in my Uber and scared my Uber driver, not something you should do in California traffic by the way. 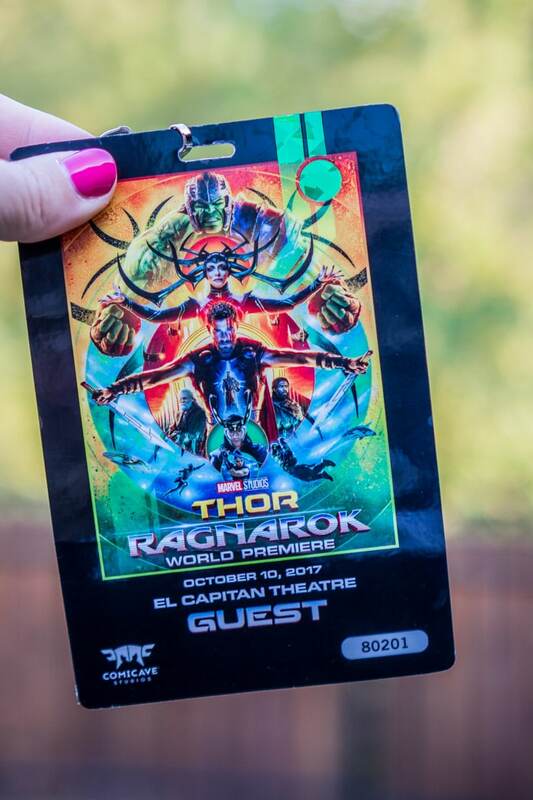 Then I kept reading the invite and realized that the event included going to the red carpet premiere of THOR: RAGNAROK. Cue more screaming. And a mini freakout in the back of the same Uber. What in the world was I going to wear? What is a red carpet experience actually like? Will I actually see Chris Hemsworth? And so on. Pretty sure I got nothing done during the three days I was in Santa Barbara because my entire week was dedicated to re-watching all movies in the MCU, reading posts from friends who’d been to previous Marvel red carpet events, and searching for dresses. 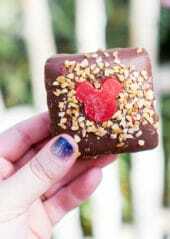 I even ordered this one, this one, and this one. 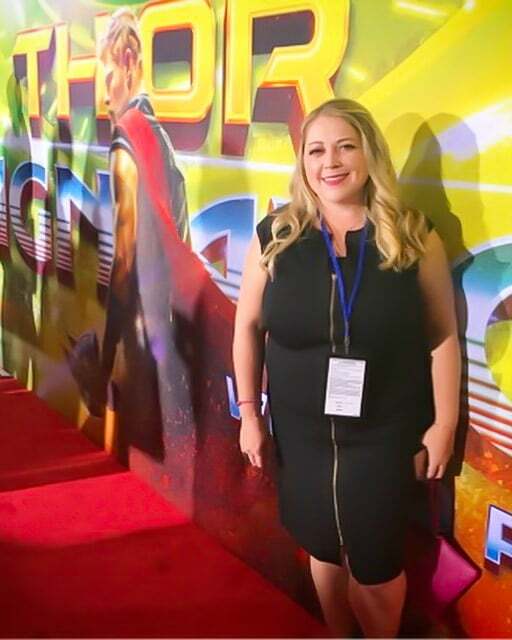 Okay maybe three days is an under exaggeration, pretty sure I was prepping for the THOR: RAGNAROK red carpet from the moment I got the invite until the morning I left for LA. I even did a one-on-one MAC makeup appointment to try out red carpet makeup style and ordered this curling wand because it promised to give me Blake Lively waves in minutes. If nothing else, I was going to be prepared for my first red carpet event. And now looking back, I realized that in all of the preparations, I was trying to find some sense of control to combat all the unknown. If I knew exactly what I was wearing and how I was going to do my hair and makeup, maybe the scary not knowing what was going on would be a little less scary. This was my first ever red carpet experience, and I had no idea what to expect. None. 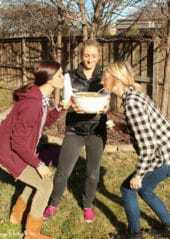 You guys, it was amazing. 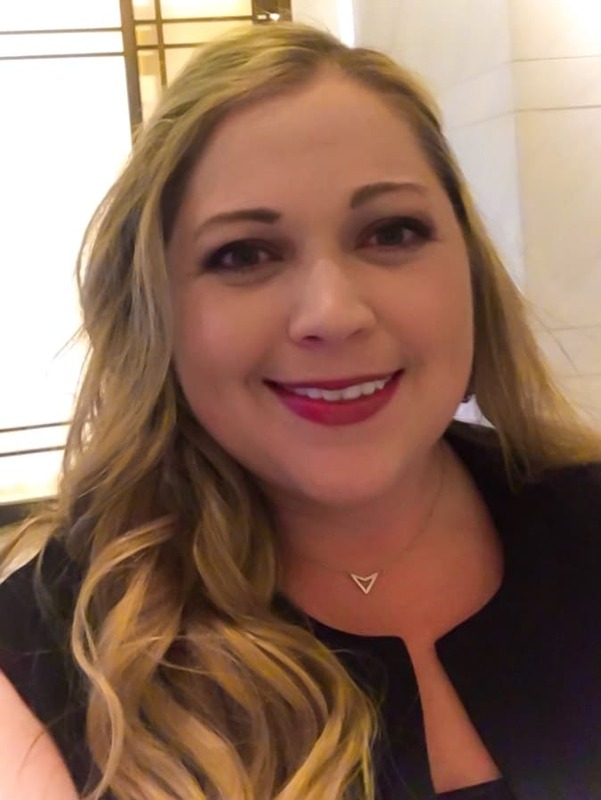 Even if my hair hadn’t been curled into perfect waves by my friend Becca or if I hadn’t found a dress that I loved, it still would’ve been amazing. Seriously, one of the coolest experiences ever! 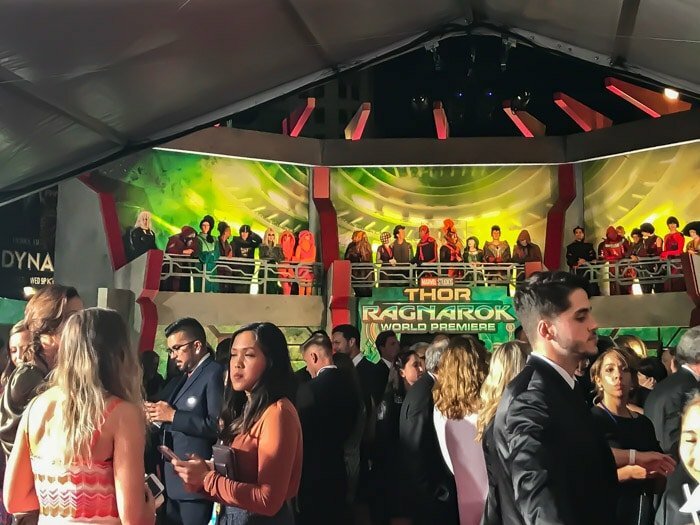 The THOR: RAGNAROK red carpet world premiere was held at El Capitan Theater in Hollywood, California on Tuesday, October 10th, 2017. We showed up around thirty minutes before the movie premiere was scheduled to begin, were given lanyards with our seat assignments, and stood in line on a Hollywood Stars filled sidewalk as they checked our bags and invitations. Talk about a way to get jazzed up for a Hollywood premiere. Then it started, and the energy was incredible. 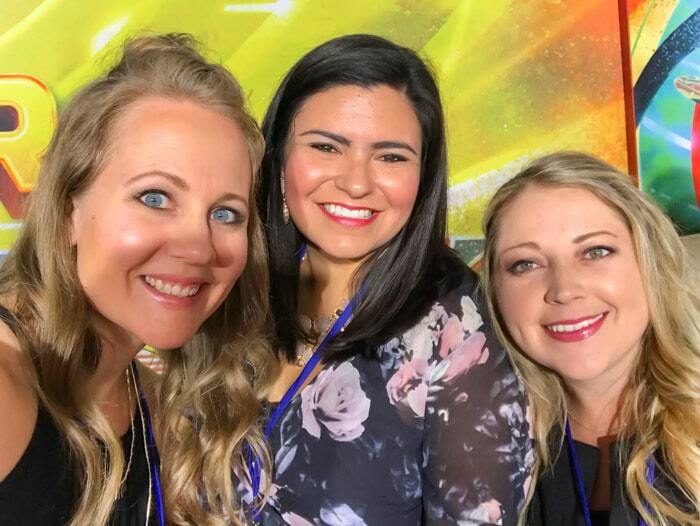 I joined my photo buddies Vanessa and Allison and we slowly shuffled our way onto the packed red carpet. We weren’t the only ones to show up right around that time (impeccable timing by our fearless leader Marshall) and within the first few feet I noticed Tessa Thompson (Valkyrie) being interviewed. You can see me and Allison in the first few seconds of this video (around 15 seconds, above her right shoulder)! No idea where Vanessa was, oops. Tessa was just the first of the stars from THOR: RAGNAROK that we saw during our red carpet shuffle. I watched Mark Ruffalo (Hulk) give Cate Blanchett (Hela) a hug and watched him interact with his beautiful wife and cute kids. I saw Karl Urban (Skurge), Tom Hiddleston (Loki), and others who I recognized but couldn’t put names to their faces until I saw them in people’s photos later. And yes, I saw Thor himself and even though I tried not to, I totally stopped my shuffling and just stared and snapped terrible iPhone quality photos. It was so fun to watch him being interviewed and then take time out of his interview to talk to this young kid, who was obviously in heaven meeting Chris. 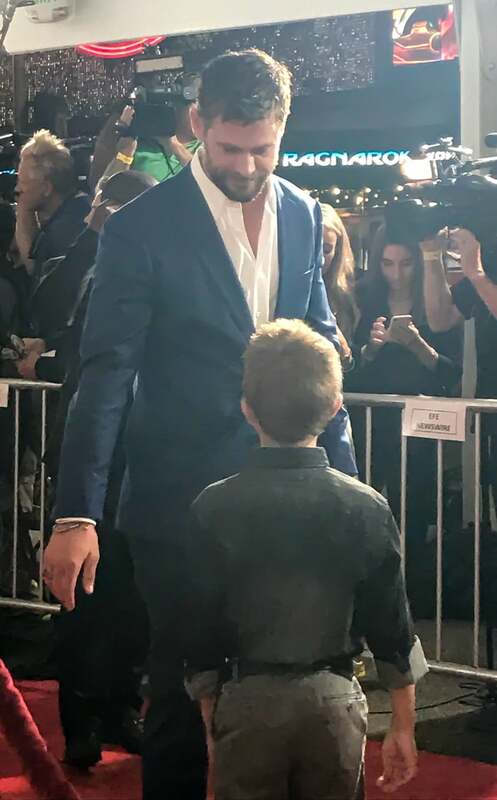 I’ve always been a big fan of Chris Hemsworth and watching the way he interacted with his fans on the red carpet made me like him even more. We might’ve stayed there a bit too long and ended up not having time to see some of the other items on the red carpet like the actual outfit Chris Hemsworth wore as Thor in the film, but it was totally worth getting to see him interact with his fans. By the time we reached the end of the carpet, it was time for the premiere to begin. They took our phones, ushered us inside, gave us free popcorn (in a fun souvenir bucket) and drinks, and walked us to our seats in the front row of the theater. 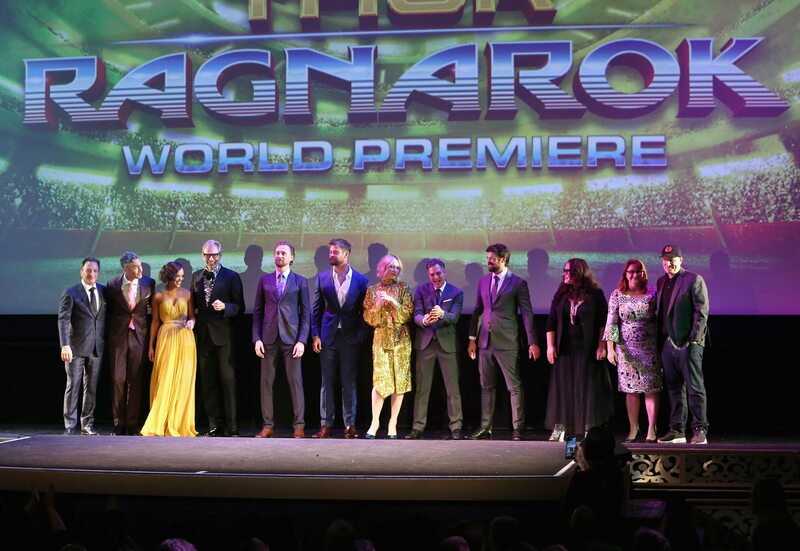 Then they did the coolest thing – they actually brought out all of the main actors on stage and everyone clapped for this group who’d worked so hard to make the film. Then the entire cast walked right by us to get to their seats. We watched the movie with everyone (many of them seeing the final film cut for the very first time) all the way to the final credits because in that theater every single person who worked on the film mattered, not just the headline actors. Cate Blanchett was sitting in the aisle seat a few rows back from me, and it was so fun to turn around and watch her reactions to the film, especially the scene when her character, Hela, walks on stage for the first time. 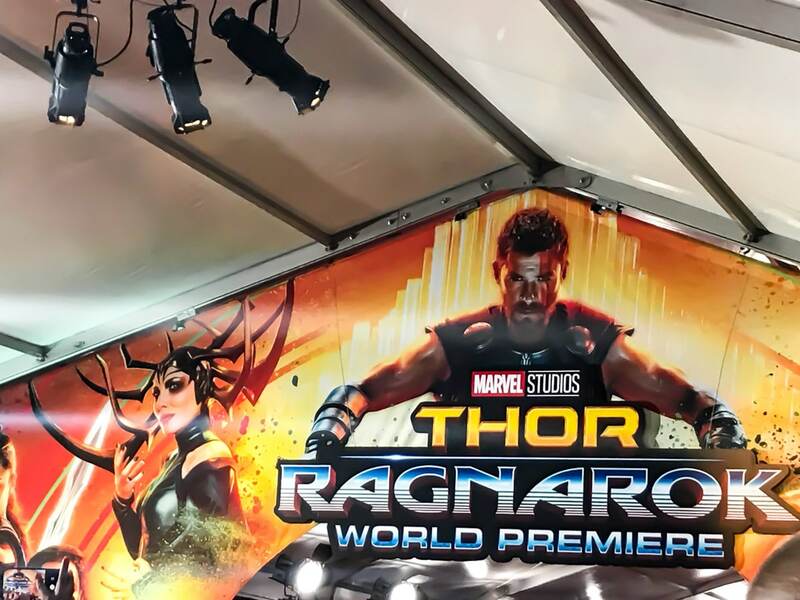 Check back on Thursday for my full review of THOR: RAGNAROK and more about watching the film with the cast! After two very fast hours, it was over. Sort of. 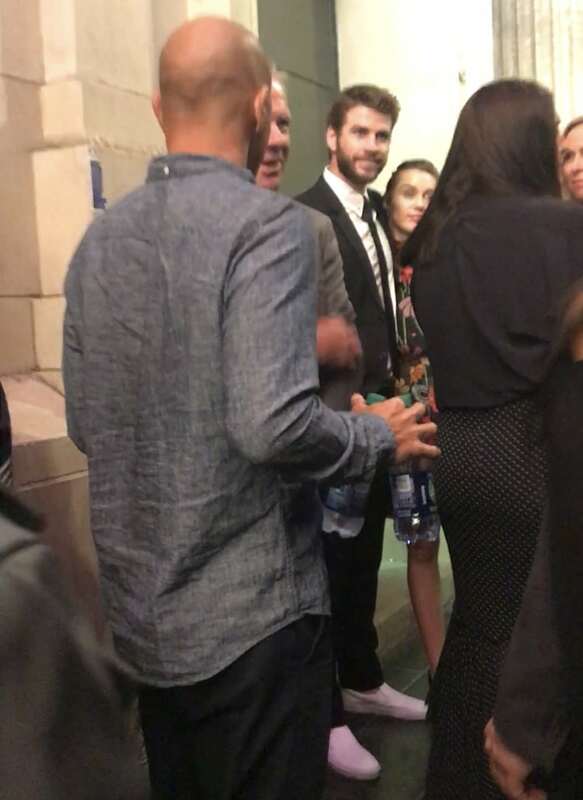 As we walked out of the theater, we just happened to walk out right behind Liam Hemsworth and Miley Cyrus. 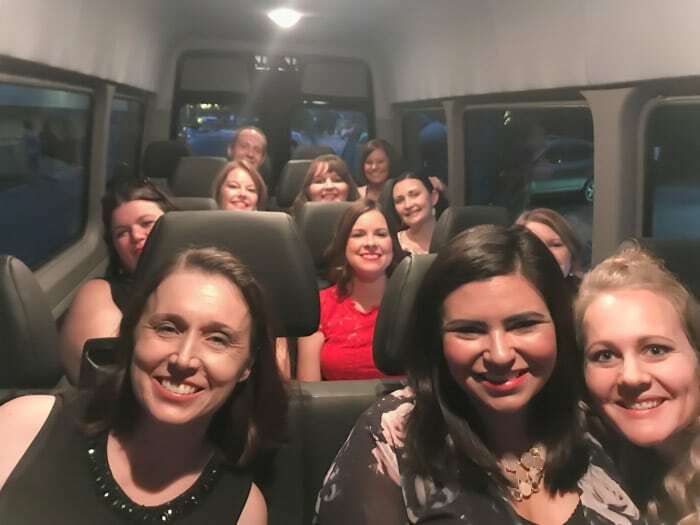 I’m not one for asking for celebrity selfies, so we just followed them out of the theater, and I stood next to them on the sidewalk not saying a thing until their publicist led them to the after party. And I might’ve taken a quick candid video to send to my sister who’s totally Team Liam in the Hemsworth battle. For the record, I’m Team Thor. Surreal and amazing. We finished off the night with a quick photo on the Oscar stairs then hopped in a van and drove home, a night over way too soon. 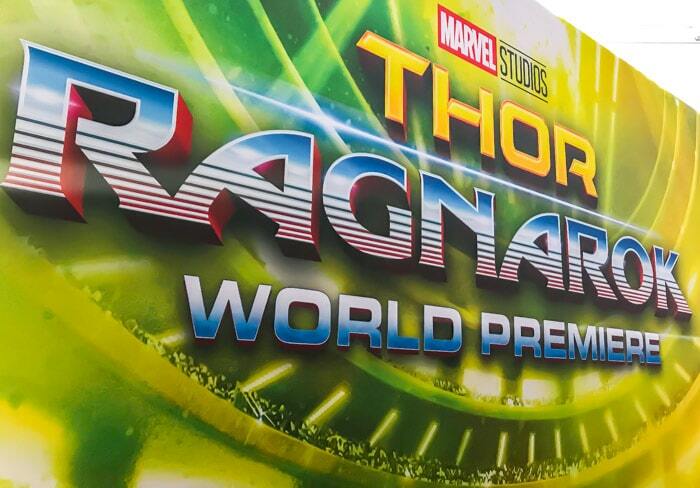 Stay tuned for all of the details from our next day – interviews with Karl Urban (Skurge), Rachel House (Topaz), , Taika Waititi (director), Kevin Feige (President of Marvel), press conference with the entire THOR: RAGNAROK cast, and the time I chickened out when everyone else was getting celebrity selfies! 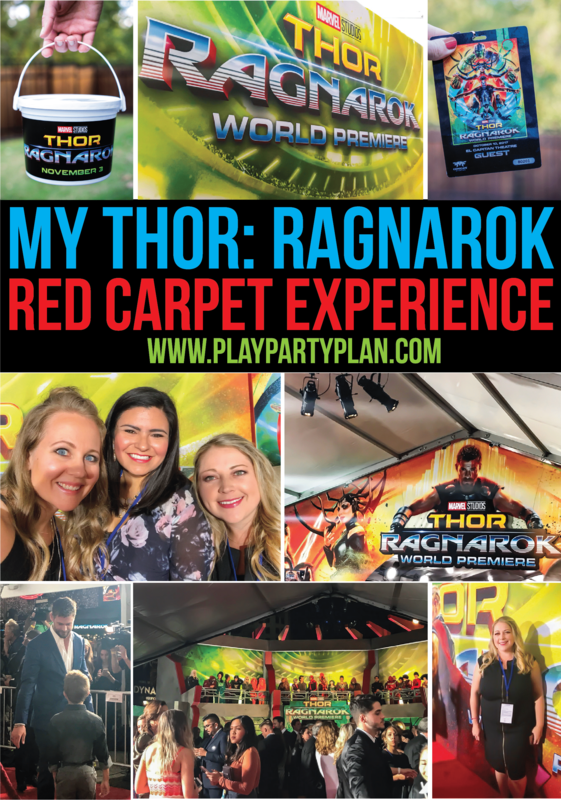 Have specific questions about the red carpet experience, THOR: RAGNAROK, or the interviews? 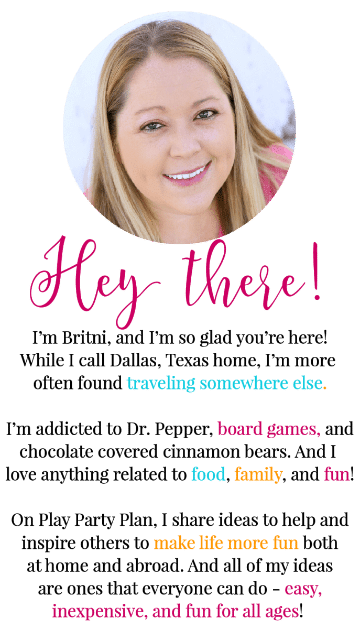 Leave comments on this post, and I’m happy to answer any questions you might have! 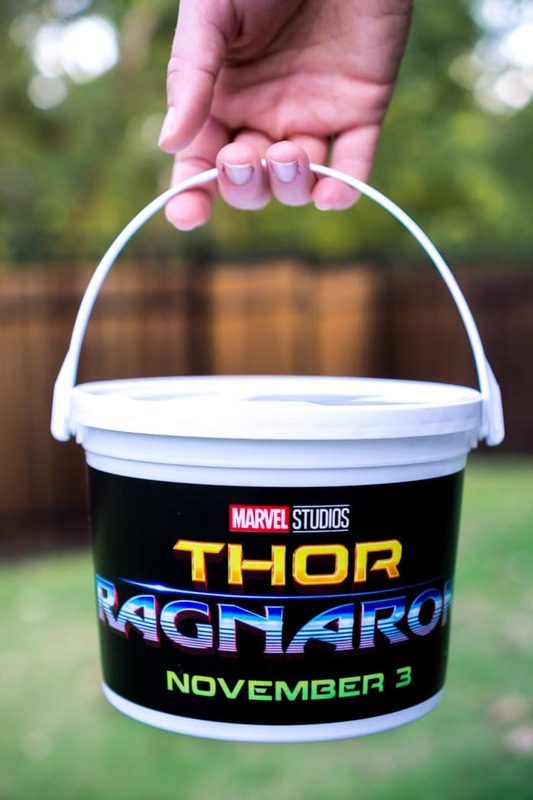 And don’t forget to buy your tickets for THOR: RAGNAROK now. The movie hits theaters in the USA on Friday, November 3rd and in the UK on October 24th. You can watch the full official trailer below then come back on Thursday for my full THOR: RAGNAROK movie review (no spoilers, I promise). It was SO GOOD to meet you!! I hope our paths cross again! 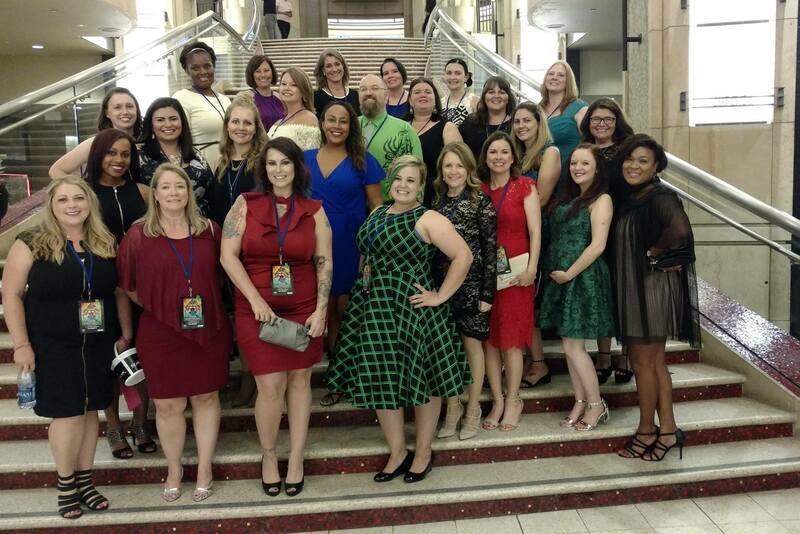 Loved reading your take on our red carpet night! 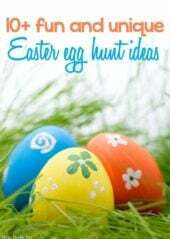 Next time you are doing my hair because yours looked amazing! But seriously, aren’t we so lucky to do what we do? What a night!